The median price of single-family homes sold in King County jumped in April, hitting $480,000, just $1,000 shy of the peak set in July 2007 before the housing bubble burst. The median price of single-family homes sold in King County hit $480,000 in April, just $1,000 shy of the peak set in July 2007 before the housing bubble burst. April’s median price was 9 percent higher than in March and 11.5 percent higher than a year ago, according to data from the Northwest Multiple Listing Service. Buyers have hit the gas, fearing higher interest rates and offering premium prices in the face of a record low inventory of homes for sale. April was the second month in a row that King County had less than a month’s inventory, a ratio of active listings to pending sales. 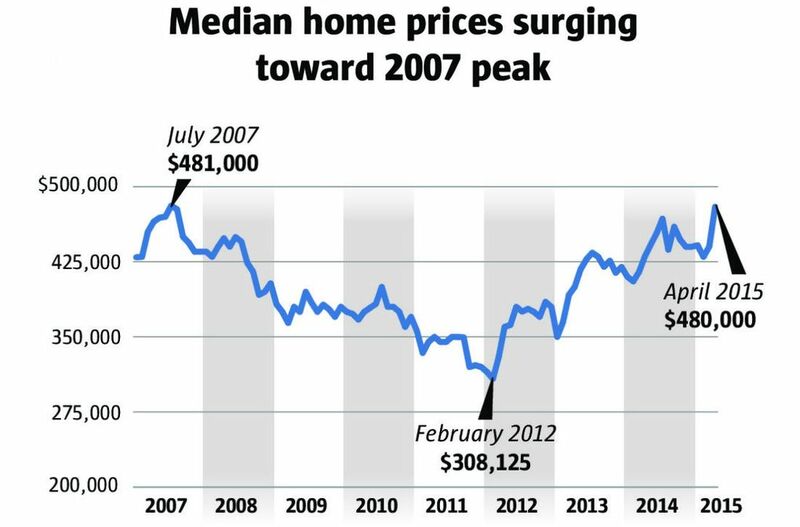 That scenario hadn’t happened in at least a dozen years, according to a Seattle Times analysis of monthly MLS data back to January 2003. Inventory is also at historic lows in Snohomish, Pierce and Kitsap counties, as buyers priced out of King County look for affordable homes elsewhere. In the four-county region, pending sales — mutual deals that haven’t closed yet — hit their highest level in any April in at least 15 years, according to the MLS. The annual price gains and bidding wars may echo the bubble years, but there’s a crucial difference, Scott said. The run-up in prices this time is fueled by job growth, new demand from foreign buyers and millennials, and a severe housing shortage. In Seattle, the median single-family-home price skyrocketed 15 percent over the year to $552,500. 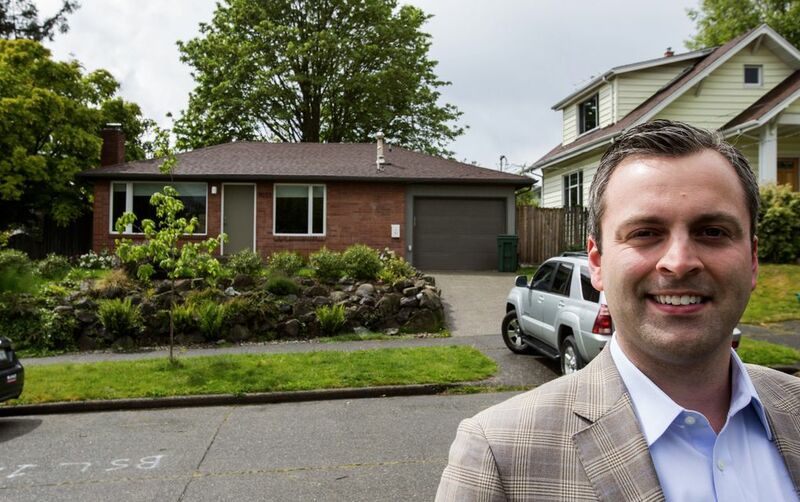 Greely, the Windermere broker, listed the north Ballard home in March for $559,000. The owners of the midcentury brick home bought it in 2013 for $452,000 and extensively remodeled the interior. The three-bedroom, one-bath house drew 13 offers, most with so-called escalator clauses that ratchet up to compete with higher bids. The top offers waived every consumer safeguard in the contract, known as “contingencies,” effectively giving up their earnest money. The winner put up roughly $100,000 in earnest money, Greely said, and released half of it immediately to the seller once the offer was accepted. The selling price, 28 percent above the list price, was $717,000 — an eye-popping $640 a square foot. The north Ballard sale may be extreme, but it’s not isolated. In King County, 41 percent of single-family homes that sold in March went for above list price, according to Seattle-based brokerage Redfin. Windermere agent Clinton Fink sold a 1928 home on Alki Point in West Seattle in March for $110,000 above its $475,000 list price. Almost 90 agents showed the house in the first week it went on the market. So many people piled into the West Seattle house on its opening weekend that the lock on the front door broke, Fink said. He never expected the house to sell for 23 percent above its list price. High down payments are required in these bidding wars, he said, because the homes don’t appraise for the purchase price. For the top bidders, “I’m asking to see not just preapproval letters (from a lender) but also people’s bank statement showing they have the down payment,” Fink said. On the Eastside, the region’s most expensive submarket, the median price increased 6 percent to $654,650. 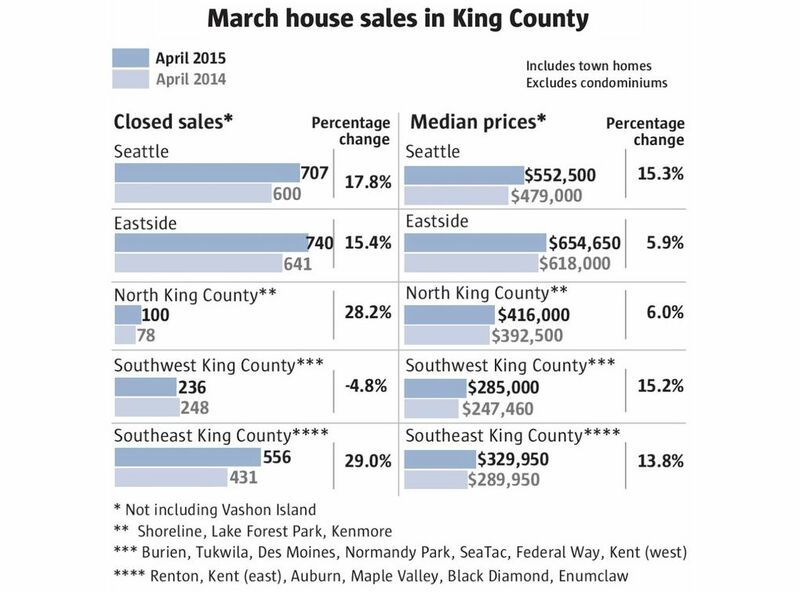 In North King County, the median price was $416,000, 6 percent higher than a year ago. King County’s most affordable areas saw prices soar, too: In Southwest and Southeast King County, median prices rose 14 to 15 percent to $285,000 and $329,950, respectively. The median single-family home price in Snohomish County was $359,975, up 12 percent; in Pierce, $249,950, about 14 percent; and in Kitsap, $256,750, 8 percent higher. For the first four months of this year, King County’s median single-family-home price now is within spitting distance of the 2007 peak. But South King County and Vashon Island have not recovered the ground they lost, according to a Seattle Times analysis of MLS data. Most of these submarkets are still more than 12 percent below their last peak. First-time homebuyers who don’t have a big cash down payment may find a starter home in these places, especially if they wait until after the busy spring and summer season. A $350,000 starter home is likely going to need new carpet, paint and even upgrades to plumbing and electrical systems, said Fink, the Windermere agent. “Start looking in areas that aren’t red hot,” he said. Condominiums may be an alternative. 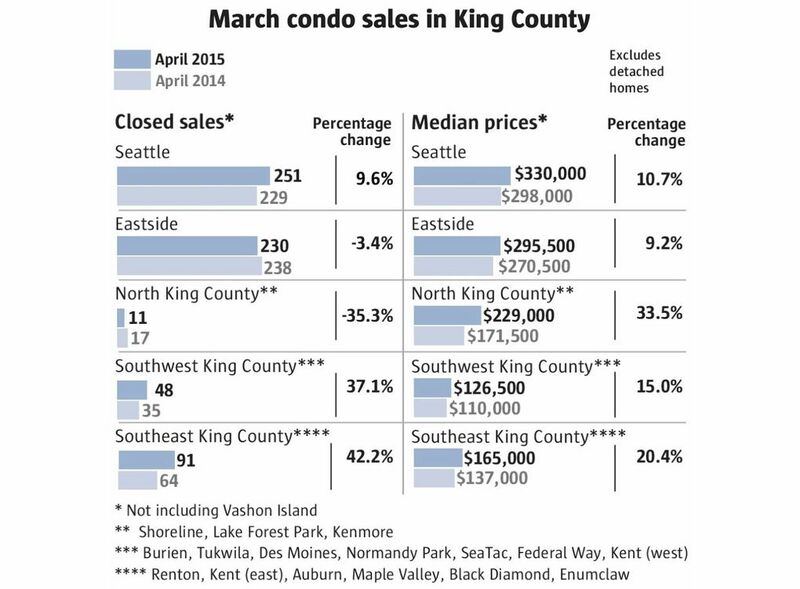 King County’s median condo price in April was $272,000, almost 9 percent higher than a year ago. Downtown Seattle, the biggest condo submarket, saw its median price dip almost 1 percent to $456,000. But prices soared 18 percent in West Bellevue, the most expensive condo submarket, to $550,000.